Most people in the UK, especially if they have young children in the family, would consider a lawn to be an essential element to be included within the design of their garden. Lawns aren’t considered to be a low-maintenance element of the garden, after all they need to be attended to at least once a week in the summer, but they are a quintessential part of the English garden. 1. 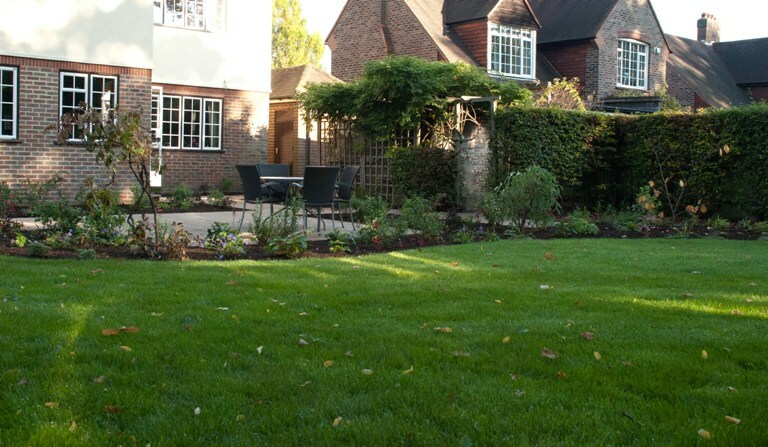 Shape – think about the shape of the lawn and design it as a separate entity to the rest of the garden. In small gardens, shapes with straight edges tend to be easier to work with as they are easier to mow also feel more comfortable within a tight space. If you are lucky enough to have a larger garden then more informal curves will work really well, and of course may suit your personal style better. Just be mindful that large sweeping curves will be much easier to mow than smaller curves. Think about the corners too – small difficult to reach areas will be impossible to keep cut with your lawn mower. 2. Edging – think about using an edging to keep the shape of your lawn in tact. For straight edges you can use simple timber edging or something a little more decorative such as paving bricks or small slabs. For shapes with curves you can use a flexible edging such as EverEdge, which will really help to maintain the curve as the garden matures and will be much easier to maintain in the long run. 3. Mowing Strip – if you have walls around your lawn area you will need to consider the point at which the lawn meets the vertical face of the wall. It will be impossible to mow the edge so that it looks neat and unless you want to go round the garden with a strimmer or cut the edges by hand you’ll need to introduce some sort of mowing strip to make your life easier. A timber sleeper, a narrow row of paving or a brick edging are all options, but often it is better to separate the two with planting – it’s just much softer on the eye. 4. Paving – when lawns meet areas of paving directly, it can often feel quite harsh. Both the terrace and the lawn have a different function, so if they meet directly it can be a little confusing. What works really well from a design perspective is to think about the terrace and the lawn as separate spaces – define them as such with planting between that can be linked with pathways. The garden will feel much bigger because the planting gives the space more three-dimension. 5. Planting beds – take care when putting together a planting scheme around the lawn areas. Consider the habit of the plants at the edge and if they are likely to flop over on to the lawn, plant them further back. Plants that encroach on the lawn will prevent the grass from growing beneath them and you’ll end up with bald patches at the edges.